Baking has always been at the forefront of my family. Good food and family have always been an integral part of my life as a young girl and baking in the kitchen with my grandmother was my happy place. Once sought upon for confectionary goods for my office parties and colleagues birthdays, baking soon became not only a passion but a fulfilling business. Now as a wife and momma to a darling little girl of my very own I have the wonderful privilege of sharing that joy with my family! A little over a year ago I fell in love with cookie decorating and all things alike. The idea of creating such wonderfully delicate and delightfully delicious works of art amazed me and the possibilities are truly endless! 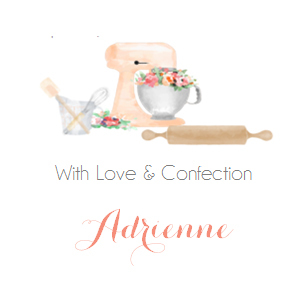 The warm and welcoming community of cookie artists inspired me to take my love a step further and contribute to such a great community by bringing you all the wonderful cookie baking, decorating and packaging supplies from the names you’ve known, loved and trusted throughout the years. The technique of cookie stenciling was so amazing to me that I decided to create and release seasonal lines of our very own confectionary stencils! Confectionary stencils are a wonderful way to add details and depth to your artisanal creations with precision and ease. Using confectionary stencils is a wonderfully fun and exciting technique that I’ve fallen in love with and I’m sure you will too! You will love how stencil designs work seamlessly with your design concepts to give your artisanal creations the show stopping pop they deserve! Our goal at Couture Confections is to provide the supplies needed to help create your confectionery works of art with joy and ease along the way. We cater to the bakers and cookie makers’ needs and we’re here to help you bake the world a sweeter place, one confection at a time! We would love to see your wonderful creations so please feel free to share your works of art with us on any of our social media networks; we’d love to hear from you!